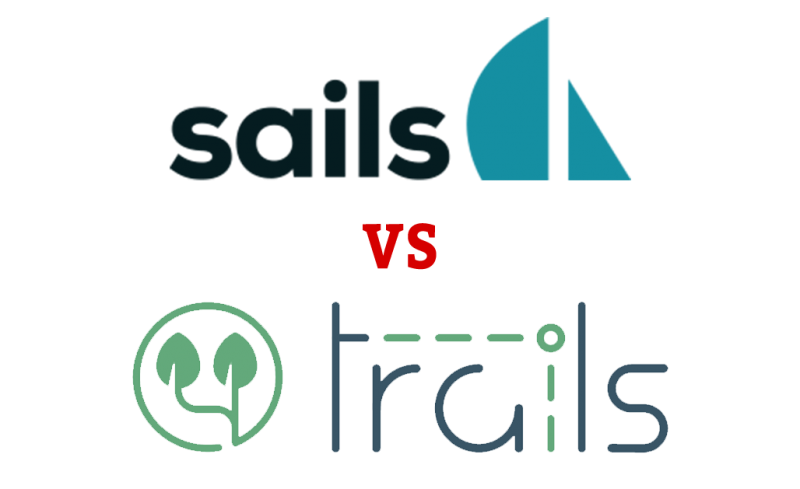 I hear a lot of people who ask What’s the differences between Sails and Trails ? or Why should I use Trails instead of Sails ? so I decide to explain my vision and things I have seen between these two Node.js frameworks. I will not tell you one is better than the other, I will let you judge about this because it will depend of your needs and philosophy. Sails : Sails.js is a web framework that makes it easy to build custom, enterprise-grade Node.js apps. It is designed to resemble the MVC architecture from frameworks like Ruby on Rails, but with support for the more modern, data-oriented style of web app development. It’s especially good for building realtime features like chat. Trails : Trails is a modern, community-driven web application framework for node.js. It builds on the pedigree of Rails and Grails to accelerate development by adhering to a straightforward, convention-based, API-driven design philosophy. I will add that Trails is not a fork of Sails, in fact 0 line of code come from Sails. Trails was full rewrite and is a new fresh framework. When you start using Sails, it’s magic you put your files under api and start your server and Sails load them automatically. It also loads config automatically. That’s cool for developing a prototype quickly, but loading all these file take time and can slow down server start (yes #perfmatters ^^). In Trails it’s quite different, nothing is loaded automaticcaly, if you look a Trails project you can see in each directory an index.js, if you take a look at it you can see it only loads each file. Like this if you want to exclude some files from Trails you can, it will only load the files put in the index.js. By default if you use the yo generator to generate your files it will add it automatically under the index.js, if you don’t, don’t forget to add it on it or it will be ignored. Mistake can append because of this. With this kind of loading system that’s mean if you don’t want an MVC architure, you can change it to whatever you want, but files must be in the index.js at the end. As we speak, Sails use express 3 as web server, I don’t have to remind you that this version of express is more de deprecated, it’s even not maintened anymore by the express team. They work to migrate to express 5 (no 4…) but it’s look like a big work to do this. You can’t choose another web server than express. Sails come with Waterline at first, you can change to another ORM, but officially there only Waterline and you have to disable it to be able to use another one. Trails support multiple ORM, the first one is Waterline too but it’s not buddle with Trails, if you don’t want it just don’t install it and install the ORM you want to use (Bookshelf for example). Socket.io is the framework used by Sails, it’s unbedded dirrectly in it. You can use another but have to disable socket.io first. Once again Trails doesn’t have an one official web socket framework. You can choose witch one you want or create your own and don’t install the Trails one. Grunt is used by default to manage assets but you are free to use Gulp or anything. Trails doesn’t have an asset manager by default, you have to install Webpack, Gulp or the one you want. Sails call this Blueprints, you can configure them to enable/disable what you don’t want to be generate automatically. Trails call this Footprints, you have to install the module to be able to use and configure them. Sails call his modules hooks they can be under your project or install with npm, with some work you can embed some MVC API in it that will be load/merged in Sails. Trails have two systems, the first one is trailpacks, there are loaded from your main.js config file and can embed MVC API and configuration files that will be automaticaly merge with Trails project. They can’t be under your project, they have to be installed with npm. The second system is microservices, I will not talk about it for now because it’s not define yet 🙂 but take a look at it on github later. Trails use ES2015 (ES6), that allow developpers to use classes, const/let declarations and more… (see http://es6-features.org/#Constants), it can run on Node 4.0.0 and more. Now you know all about the differences between this two MVC Node.js frameworks. You can make your choice and start coding ! 🙂 for now Sails is in v0.12 and Trails is in beta (7). Thanks for your article. I used sails for a small project, but found it missing too many features, so I switched to django. Waterline tries to be too generic, working with both SQL and NoSQL databases. Since I was using SQL, the results was too difficult to use. Joining multiple tables using futures was just too cumbersome. Also, sails may work well with REST, but the included HTML template engine was also difficult to use. PS. You should run a spell checker on your post. I’ve been using Sails to develop a content management system with user permissions for a small company I work at. Having never actually done this before, using Sails has helped me greatly improve my programming and logic. Highly recommend it as a starter solution for people who are new to web development and want to get their feet wet without feeling overwhelmed. In fact with Trails I use Express.js 🙂 (Sails.js also use Express.js under the hood) Trails.js offer a real architecture compare to just use Express.js, it also offer a way to work with multiple framework but in an organized way.